DHL&S’s 2018 Jeans for Charity recipient – Project Purple, Inc.
Our DHL&S Jeans for Charity program encourages employees to donate money weekly to a fund that is matched by the Firm, in exchange for allowing participants to wear jeans on Fridays. The DHL&S Jeans for Charity program has donated more than $58,905 to local charities since it was established in 2004. 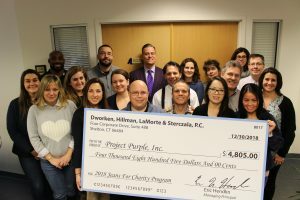 Project Purple is a Connecticut-based 501(c)(3) non-profit organization created to raise awareness, support patients and families affected by the disease, and fund research efforts to defeat pancreatic cancer. Donations help support patients struggling with medical, pharmaceutical, and everyday living expenses related to their fight against pancreatic cancer. Project Purple funds also research for early detection and finding a cure for pancreatic cancer.